On August 2, 1985, a Lockheed L-1011 approaching to land at Dallas/Fort Worth International Airport's runway 17L encountered a microburst while attempting to pass through a rain shaft underneath a convective storm cell. The aircraft touched down in a field approximately 6,000 feet short of the runway, bounced, struck a car on a highway, struck two water tanks on the airport and broke apart. With the exception of the tail section which broke loose from the rest of the airplane, the impact sequence and resultant fire destroyed the aircraft. Of the 163 persons aboard, 134 passengers and crewmembers were killed at the scene. The driver of the car was also killed and two passengers died more than 30 days after the accident as a result of their injuries. This accident highlighted the inadequacies of the then-current ground-based low-level windshear detection systems employed at many airports. It also highlighted that crew knowledge of the effects of "microbursts" training was inadequate to combat this threat to aviation safety. 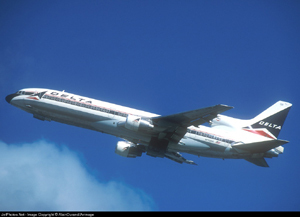 Delta Flight 191 became the catalyst in accelerating the development of airborne real-time windshear detection, windshear avoidance philosophy, and the widespread deployment of early warning systems.